Inspired by her teaching experience at Chávez High School in Houston, English alumna Ashley Hope Pérez writes about disadvantaged teens struggling to meet their obligations at home and follow their dreams. However her newest book “The Knife and the Butterfly” (Carolrhoda, Feb. 2011) is about the students she didn’t get to teach, the ones who slipped through the cracks in the system or dropped out of school. The protagonist, Salvadoran Martín “Azael” Arevalo is one of those fallen students. The story unfolds when Azael wakes up in a locked cell after a gang fight in a Houston park. Unable to piece together the events that landed him behind bars, yet again, he realizes that something is not right. Things get really weird when he’s assigned to secretly observe another imprisoned teen named Alexis “Lexi” Allen. Despite their personality clash, the two troubled teens soon find themselves inexplicably linked in this gritty paranormal thrill ride. This up-and-coming young adult author was kind enough to chat with ShelfLife@Texas about how she learned the inner workings of street gangs, the connection between teens and the paranormal, and how she surprised herself with a twist ending. 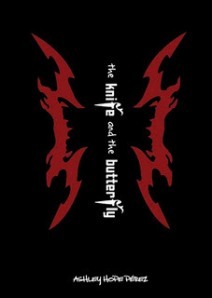 How did you come up with the title “The Knife and the Butterfly”? The duality expressed in the title was a focusing one for me as I wrote. As I say in my author’s note for the novel, I wanted to show Azael and Lexi’s world as much more than a patchwork of crime and violence. In addition to the very real threat of their circumstances and the danger of poor choices, I tried to capture these two teens’ vulnerability and their potential for redemption. What made you decide to dabble in the realm of paranormal fiction? It wasn’t as simple as a decision, exactly. Yes, there is a “paranormal twist” to “The Knife and the Butterfly,” but much of the novel (say 90 percent) is occupied with the gritty world Lexi and Azael live in on the fringe of mainstream society in Houston. The paranormal was a bit of a surprise to me, too. That is to say, I didn’t set out to incorporate paranormal elements in my novel; they became necessary for me to change the rules of my characters’ world just enough so that they could make different decisions… so they could have the second chances that are built into the system for many middle-class teens. You mentioned that you even surprised yourself with the twist at the end. How did this come about? The ending developed unexpectedly out of exploratory writing I was doing about Azael’s street art. This whole thread—Azael and his relationship to spray paint and the walls of his city—was a challenge for me. I am very much a rule follower, so it took me a lot of effort to rethink graffiti as “street art” and to come to understand what it meant to Azael to write right on the faces of the structures around him. Anyway, I was writing about Azael’s thoughts as he was drawing, and then all of sudden I was writing the ending. And once it was there on the page—and I knew it was the ending—it was the only possibility that felt right to me. It went through plenty of revision and development, but the thrust of the final part of the book didn’t change. I embraced it with its paranormal baggage. Why do you think young readers are so enthralled by the paranormal? You’d think I’d have an ironclad thesis after teaching a course on vampire literature for two semesters, but to be honest, I’m not sure. Within YA, I tend to shelve myself alongside contemporary realists, not fantasy writers. Still, if I were to hazard a guess, I’d say the paranormal provides novel ways of thinking through and dramatizing teen (and human) issues. In fact, one of my favorite student papers interpreted one vampire in literature as an eternal adolescent. How did you familiarize yourself with inner-city gangs? Because Crazy Crew is a “home-grown” Houston gang, details related to it came mostly from news coverage and other local sources. MS-13 (La Mara Salvatrucha), on the other hand, is an international gang that has been described by some as “the world’s most dangerous gang.” I did extensive reading about MS-13, including many first-person accounts, but I focused on the particulars of the gang’s activity in Houston, which are generally not quite as extreme as what you might see in the heart of Central America. For both gangs, I needed to learn specifics: their hand signs, the “rules” of initiation and involvement, linguistic patterns and so on. I would never want to trivialize or glamorize gang involvement, but at the same time I think some media portrayals are a bit exaggerated and fail to capture the nuances of actual teens’ experiences. For example, readers will notice that—contrary to most Hollywood portrayals of gang violence—there’s not a single gun involved in the fight that opens “The Knife and the Butterfly.” This is pretty consistent with the two gangs portrayed. I’ve found that when I ground my writing in particulars, a lot of stereotypes fall away. The story is primarily narrated from the point of view of Azael. How were you able to capture the language of a poor teenage gang member in Houston? You found a very nice way to ask something that some teen readers, upon meeting me, put a lot more bluntly: “How did YOU write THIS?” They pick up immediately on the fact that I am not someone who, in conversation, would describe a package of Cheetos as “spicy-as-f**k” (Azael’s words). How, then, can such words come out of my pen? A lot of it was shameless cribbing from what I heard kids in Houston say, both in the hallways of the high school where I used to teach and in the taquerías and hangouts of working-class neighborhoods. I spent a good amount of time in the areas where the novel is set (mainly the Montrose area and a run-down stretch of Bellfort). I also paid attention to the language used in the interviews I read and would sometimes mimic patterns of phrasing. Now, in terms of emotional truth in Azael’s language, I chalk that up to a willingness to imagine experiences and ways of seeing that are unlike my own. I recently heard Lionel Shriver talk here in Paris, and she said that for her, writing from a male point of view is not the big leap; the big leap is getting inside another head, period, and discovering those individual particularities, the quirks of mind inside the many big things we have in common. I agree, and I think you could substitute “poor” and “gang member” for “male” and still find the notion to be true. I’d love readers to leave the pages of “The Knife and the Butterfly” with a sense that second chances aren’t doled out equally. And I hope that they will feel a bit more urgency about being a positive presence for those who, as far as they had thought before, don’t even deserve to be redeemed. I’m knee-deep in a very messy first draft of a historical novel set in 1930s East Texas, near where I grew up. There’s an explosion, an interracial romance, a pair of twins, and a significant shoe. That’s all I can say without transgressing certain foolish writerly superstitions. About the author: During her time at The University of Texas at Austin, Perez won several writing awards including a $5,000 George H. Mitchell award for her essay on Anne Sexton. She went on to teach high school English in Houston – sending a number of students back to The University of Texas at Austin. She is now finishing a doctorate in comparative literature at Indiana University and teaching English in Paris. She also teaches undergraduate courses for her department, including literature about vampires and a course on women writers of the Caribbean. Her first young adult novel, “What Can’t Wait,” is also inspired by her Houston high school students. 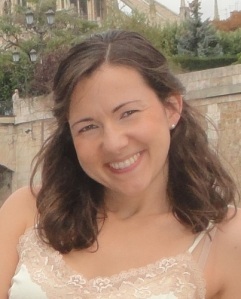 This entry was posted in Alumni Books, Author Interviews and tagged Ashley Hope Perez, College of Liberal Arts, Department of English, the Knife and the Butterfly, What Can't Wait by Jessica Sinn. Bookmark the permalink.